Selling a home these days requires more than just taking a few pictures and listing it in a weekly real estate magazine. Today’s sophisticated buyers expect to walk into homes and experience what it might be like to live in them. That is one of the reasons experts recommend staging a home before showing it to prospective buyers. Staging is one of the services we provide. As such, we have learned a thing or two about what makes buyers tick. We’ve also learned what turns them off. Would you believe that collectibles qualify as turn-offs? It’s hard to believe, but it’s true. Those of us who collect things tend to have a distorted view of our collections. We just assume that because we love something in particular, everyone else will love it too. We assume that others cherish our collections as much as we do. Unfortunately, that is rarely the case. What’s worse is that a house filled with collectibles is one that buyers have a hard time imagining themselves living in. The first thing to understand about staging a house filled with collectibles is this: all of those collectibles are personal items. They mean the world to the person who owns them. That’s fine. But they do not mean the world to prospective buyers. This creates a conflict. A prospective buyer looking at a house filled with collectibles sees the personality of the current owner in that house. That makes it nearly impossible for the buyer to step back and imagine herself living there. She cannot imagine how she would make the space her own because all she can see is the current owner’s personality. Does that make sense? It has been our experience that homes filled with collectibles do not sell nearly as easily. And when they do sell, they don’t command prices as high as comparable houses that have been well staged. This suggests that staging a home filled with collectibles begins by cleaning those items out. 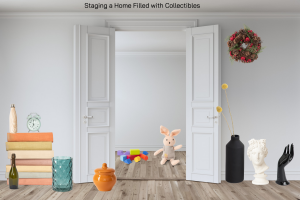 If staging for a fast and productive sale means removing collectibles – and it does – the homeowner has some decisions to make. Will the collectibles be stored away or disposed of in some fashion? And if they will be disposed of, in what manner will the disposition take place? We have helped clients who found it most appropriate to distribute collectibles among younger family members who might appreciate them. This is a good starting point. But we might run into a case where family members don’t want the items. Then we have to move on. Another option is to put the collectibles up for sale. Interestingly enough, collectors love to buy collections from other collectors. The benefit of selling to a collector is knowing that your collectibles are going to someone who will appreciate them as much as you do. Two options of last resort are donating the collectibles or simply throwing them away. These are the two options homeowners like the least. The idea of donating scares them because they are convinced their collectibles will not ultimately end up with someone who values them. And throwing the items away is like throwing away a lifelong labor of love. Staging a home filled with collectibles does not have to be all pain and no pleasure. What do we mean by that? Well, staging experts say that it is okay to leave a few collectibles in the house just to give the place a little bit of character. We agree. Two or three well placed items will add a nice touch without overwhelming perspective buyers. If you are getting ready to stage a house filled with collectibles, feel free to call on us for assistance. We would be more than happy to help you get your house ready for sale. We have many years of experience staging, decluttering, and organizing homes.